Image scaled down from 998px to 740px wide. Click the image to view the original. 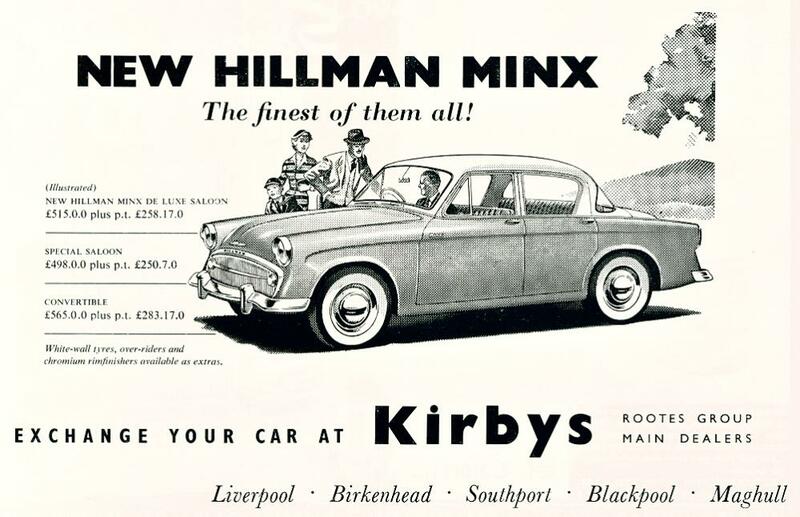 I was a resident in Maghull, Kirbys were not far from where I lived. I bought my first Hillman Imp from them, a 1964 Mk1. I used that for about two years then late in 1967 I placed an order for a new Sunbeam Stiletto. I took delivery in January 1968, one of the best cars I ever owned. I did 19,000 miles in it over ten months, sold it then moved to Cape Town , South Africa, I am still here. I worked as an apprentice mechanic from 1966 at the blackpool branch ,great staff loved it .the manager then was jack chambers. I was working at the Liverpool branch at this time. I believe there were the Kensington and Duke street locations. Would be interesting to hear from any of the old employees. I remember quite a few.